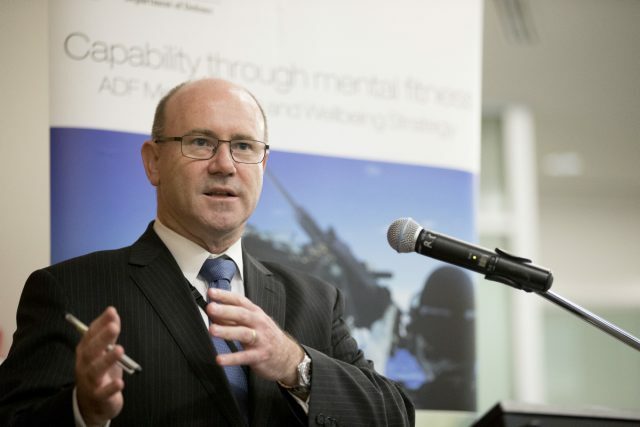 The hard part of running the Defence organisation is the trade-offs—lining up capability, strategy and resources to work out what can and can’t be done, says Department of Defence Secretary Greg Moriarty. ‘A challenge I’ve faced, that I think is an essential role of the secretary and the Chief of the ADF, is aligning those three elements,’ says the department head who’s now eight months into the job. Moriarty says that’s very difficult work but it’s also incredibly important and rewarding. ‘To think I’d like to be able to do this but I can’t do as much of it, or as quick as I’d like. So how am I going to balance that with a whole range of other work that the government’s asked us to do? With a decades-long $200 billion re-equipment program underway, is the government pushing too hard to get things done too fast? Far from coming to the job as a Defence neophyte, Moriarty has spent a lot of time there before. He joined the department in 1986, and in 1988 he graduated with the Sword of Honour and top of his class as an officer in the Army Reserve. Moriarty spent most of that first decade in the Defence Intelligence Organisation, and in his mid-20s he was sent to Saudi Arabia as an intelligence officer in the headquarters of US Central Command working for General Norman Schwarzkopf during the First Gulf War. He was part of a DIO detachment and on full-time army service as a uniformed captain during Operation Desert Shield and then Desert Storm as part of a team of ground forces analysts preparing intelligence briefings for General Schwarzkopf and his senior commanders. Defence, security and diplomatic issues have remained the focus of Moriarty’s working life, with key points as ambassador to Iran and to Indonesia, Commonwealth Counter-Terrorism Coordinator, International and National Security Adviser and chief of staff to Prime Minister Malcolm Turnbull. Moriarty was ambassador to Iran from 2005 to 2008. The Americans didn’t have an embassy in Tehran and invited him to Washington to brief President George W. Bush and a small number of his senior advisers. How did such experiences shape the thinking he brings to Defence? ‘Security cooperation and collaboration contribute in a very positive way for Australia,’ he says. The role of the ADF doesn’t simply involve delivering operational outcomes, but also what can be done through exercises, exchanges, and training and development through the defence cooperation program. Brendan Nicholson is defence editor The Strategist. Image courtesy the Department of Defence.